The two most popular winter break destinations among my friends are Florida and Israel, where it is warm and the sun is shining and coats and scarves and boots are unnecessary. They sound like pretty logical destinations during the cold winters that are typical of New York, and especially during this one, when we've had 3 snowfalls within the course of a single month. As most of my friends must have realized by now, I'm not the type of person to do something typical. Nor do I get as excited about sunny, hot days as others do (which has earned me a reputation as a bit of a vampire). So I thought it would be a good idea to go to Boston with my friend. And it was -- until we almost got snowed in there. As soon as I returned from Boston, I decided that staying in Brooklyn wasn't a way to spend one's winter break, so I impulsively planned another little getaway to Philadelphia, which is one of my favorite cities in America (after Manhattan, of course). I managed to get back to NY before the third snowfall of the season. I never really needed to use public transportation anywhere other than in New York, and I was pleasantly surprised and rather charmed by Boston's public transportation system, which we used throughout our trip to get to wherever we wanted to go. Boston is a beautiful old city with such an important history. My friend and I went to see some of the historic sites, such as the site of the Boston Massacre, the Old State House, and the Old South Meeting House, which played an important role in the Boston Tea Party. The colonists who started the Boston Tea Party met inside this house. There is also a sign inside the meeting room that indicates where President Washington once stood. We wandered around the Faneuil marketplace and found some lovely outdoor sculptures randomly standing or sitting on park benches. We then went to see the New England Holocaust Memorial, which is made of a few tall glass towers. It was quite sobering to walk through them and read the quotes printed inside. The memorial was right near an old-looking street with cobblestones, so we walked around since we had some extra time. 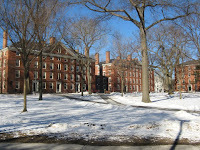 We also visited Harvard, which was beautiful, but somehow not as grand as we had imagined it to be. Although perhaps that might be because we were expecting something like Hogwarts, haha. At some point, we found ourselves on the trolley with extra time on our hands, so we impulsively stopped by Boston Common and wandered around the theater district. We also went to the Skyline Observatory on the 50th floor of the Prudential Center to see all of Boston spread out beneath us, and we watched the sunset from there and then also got to see Boston all lit up at night. And of course, no trip is ever complete in my mind without a visit to an art museum -- and ok, I admit it, the main reason I wanted to go to Boston was because I heard it had a great art museum -- so the last day of the Boston trip was dedicated to art, art, art. 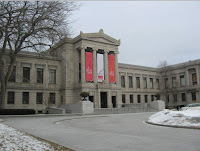 Boston's Museum of Fine Arts was wonderful and had a beautiful collection of American art. Seeing Childe Hassam's painting of Boston Common was especially delightful considering we had just been there the day before. What I loved about the museum was that there were many paintings of Boston and its history, which were fascinating to see. The museum also had a large collection of Renoir and Monet paintings, and of course, the necessary Degas and Rodin sculptures, which always make me smile. Although I originally planned to stay in Boston through Wednesday, Megabus sent me an email saying that my bus had been canceled due to the upcoming snowstorm. I got this email when I came back from the museums, at nearly 7 PM. Uh oh. Well, by 8 PM I was on a Chinatown bus to NY, with the help of my amazing hostess who rushed me to the bus station just in time. I don't think I ever packed all my things so quickly as I did then in order to make it in time. I returned to NY in the middle of the snowstorm, when the roads were already filling up with snow. And that was my traveling adventure for my 2011 winter break. Or so I thought, until I was browsing the Megabus site and saw that I could get free tickets to Philadelphia for the following week. It was very, very, very tempting, since I love Philadelphia very much and have already been there 4 times in the past. And of course, it has a major art museum. Can you tell where this is headed? ;] At first, I thought that it would just have to remain a dream for now because I had only just returned to NY. But then I figured -- why not? I still had a week and a half of vacation left, and it was free, and why not enjoy myself? I quickly began working on making it a reality. I want to return to Philadelphia again in the near future and go to the Museum of Art again as well as a few other places I haven't seen yet. Actually, if possible, I would like to make trips to Philadelphia a yearly ritual. :] Who's up for being my travel buddy? Life has its ups and downs, but it's important to remember that there will always be an 'up' and that this rollercoaster has to climb up too. And yes, life throws things at us that we are often completely unprepared to handle, but we do not have to handle them alone. There are times when we want to give up, when life becomes overwhelming, but this too shall pass. The strong, resilient, brave individual that I know will pass through this and become stronger than ever and will go on to succeed and achieve great things and win the love and admiration of many more people -- because I believe that she can. In life, you want to have progress. You want to continue to always get better at what you do and work harder and achieve more. But sometimes, no matter how much you want it, it's difficult and you become frustrated because you just don't know what to do. Well, that's how I feel right now about my creativity. I used to write every day. I could become wrapped up in a novel and work on it for months and pour all of my energy and thought into it. I could write ten short stories in a week -- stories that I would put away in a folder somewhere and then find a year later and think, "Wow, this is actually pretty good! I like it! Did I really write this?" Well, that was then. Now, I can't remember when was the last time I wrote a short story or worked on my novel. Now it's just blog posts, articles, essays, journals. Mundane things that generally contain barely any creativity. Sure, it comes easily to me -- but it's not what I am passionate about. Writing fiction used to make me feel so alive and excited! I would start writing a story and get lost in it, forgetting everything around me, tuning out the whole world, and just existing in one where I could create the rules. I think I realized partially now what has changed and why I haven't been able to do that for a while. When I used to write before, it was because there was something in my life that I wished could be different, and I expressed that through my writing. I would create a world in which it was different, where it was the way I wanted it to be. Anything I wanted could come into existence through my pen, and I took advantage of that opportunity. If I wasn't feeling so happy and wanted to escape from reality for a bit, I knew where to go. Even when I was just bored out of my mind during some classes, I knew that I could find adventure without disturbing anyone. Writing made me happy; it was intoxicating for me. As you can probably tell from some of my recent posts in which I'm on a Stern-high, I haven't really felt compelled to change my life recently. The past few months have been the best ones of my life so far, and I'm living and enjoying life to the fullest. An unfortunate side-effect of that is writer's block. Anger, pain, sadness -- they're all so easy to translate into writing. I can use those feelings in order to throw myself deeper into the stories I'm writing. But happiness, satisfaction, serenity? They seem to achieve the opposite effect. I am thankful that my life is at such a good point right now. But I miss that feeling of writing because I feel I need to, that intense feeling that compels me to write and to create. Quite frankly, I'm at a bit of a loss right now as to how to regain that feeling and made it coexist with my current happy state of mind. In the words of Jim Boggia, whose songs are among the most meaningful in my iTunes library, "‘Cause I can wax philosophic/‘bout my troubles and my pain./Go on and on and on/when I’ve got reason to complain" and "I used to spend a lot of time thinking about the way things might have been./That kind of thing often inspired me to sit down with paper and a pen." Check out the song on iTunes -- it's called 'Made Me So Happy,' and I absolutely love it. I took my last final of the semester on Tuesday and submitted my last philosophy paper (which was very interesting to write even though I was rather short on time), and that means that I am now done with my first semester at college. Yay! :] This calls for a celebration! My first semester at Stern flew by pretty quickly, and those few months were some of the best in my life. I took fascinating new subjects, met interesting people and made amazing friends, got involved with a number of clubs, and got barely any sleep during the week because there was always just so much to do! And now I get nearly three weeks to take a few deep breaths and rest before jumping into my second semester. You know, I spent part of this past summer wishing it would pass by quicker so that I could finally be in Stern. I couldn't wait to start this new adventure and experience Stern, but sometimes I wondered how disappointed I would be if the reality didn't live up to my dreams. Reality is almost never as perfect as a dream, and it would be ridiculous to expect it. But the past few months really have been a dream, and I can't remember when I have been happier in my life. In Stern, I can be running on less than 3 hours of sleep a night and yet I will still walk down the street to college with a huge smile on my face and humming a song to myself, thanking G-d for being alive. I'm happy here.... Sure, I spend about two hours in total each day on the commute and I stay up late at night writing long papers and studying, but life's good. It's this indescribable floating feeling, almost as if I have wings and am soaring. ~ I took some very rewarding courses -- Samuel I, Intro to Talmud, Hebrew, Great Ideas of Philosophy, French, and Historiography. I don't think I ever worked as hard for any other class as I did for that last one. It involved extensive readings twice a week and four 6-page papers over the course of the semester. I would finish those papers close to 6:30 AM, when my father would be leaving for work. He felt bad for me that I was going to sleep so late, and I felt bad for him that he was waking up and going to work that early. The bottom line is that 6:30 AM is not a good time to be up, but we all do what we have to do. Let me just say that the A I got in historiography was the most hard-earned A of my life so far. It's actually good in a way -- I can be proud of myself for it because I feel as if I really deserve it. ~ I made friends with so many people from all over the world and I feel so blessed to have them in my life now. There used to be times in my life where I felt I couldn't share certain things with my friends just because our interests were so different and even though they might patiently listen because they were my friends and cared about me, they wouldn't fully understand where I'm coming from. Well, the student body at Stern is huge and there are girls from all different walks of life and I've already met some that have become such good friends to me. They make me feel so comfortable around them, and I feel I can trust them with anything. There are some girls who gladly invited me to stay with them when I wanted to spend Shabbat in Stern or had to be in the city late and needed a place to stay. ~ I started giving docent tours at the Yeshiva University Museum, which has also been a very rewarding experience so far. In order to give tours, I first had to study the exhibits and learn more about them, which was interesting and gave me an opportunity to learn so many new things. ~ I became a board member of the Creative Writing & Poetry Club in Stern. I was so excited when I heard that such a club even existed, because it is pretty much a dream come true for me. We had some awesome, fun events already and hopefully next semester will be awesome too. ~ I wrote my first article for Stern's official student newspaper, The Observer, and it was published in the December issue. ~ I learned of the existence of the Russian Club in Stern, which put such a huge smile on my face because I love bonding with fellow Russians. Actually, I have met so many Russian people in Stern with whom I felt an automatic connection. It's funny because in all other colleges, Jews automatically feel connected to the other Jews in their classes because they have something in common, while in Stern everyone is Jewish so you have to narrow it down a bit. ~ I went on a scavenger hunt with some other students at the Metropolitan Museum of Art. Although I've been to the museum many times over the past few years and know it almost inside out, that was a completely different experience and it was a lot of fun! ~ I spent Shabbat in Stern 4 times and loved it each time. Kabbalat Shabbat in Stern can be one of the most beautiful experiences ever. The only thing that took some adjusting to is the fact that I was walking around Manhattan on Shabbat. I kept thinking, "Hold on... but this is the place where I go to classes and go shopping and go to Broadway shows. And now I'm here on Shabbat? Odd..."